Pork is an underrated meat. It’s so delicious when roasted. I wanted to create something a little different tonight. I don’t often tackle Chinese dishes but I love this dish when I eat out at chinese restaurants so decided to throw caution to the wind. 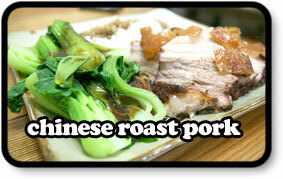 The pork is so juicy and tender with the unmistakably delicious flavour that comes from five spice. This recipe is pretty simple and the results are very impressive. I only wish I hadn’t eaten half a kilo of meat. Dry fry the two types of peppercorns in a pan until aromatic. Place into a spice grinder or pestle & mortar and grind into a fine powder. Mix this powder with the five spice, salt & sugar and set aside. Pierce the skin of the pork with a sharp knife all over. Then pour over 2 litres of boiling water. Dry the skin slightly then rub into the meat all the spice mix. Pour hot water into a roasting tin about half way up. Place a rack over the tin and put on your pork. Roast in the oven for 20 minutes, then reduce the heat to 180ºC and continue roasting for 2 hours. Remember to check the water levels of the roasting tin from time to time, topping up as necessary. After 2 hours, increase the heat to 230ºC and blast for 15 minutes. Remove from the oven and rest for 5-10 minutes before serving. Cut the pork into bite size pieces that include plenty of meat and a little crispy crackling. Serve alongside chinese greens with oyster sauce and plain boiled rice.